Sign up for the Surplus Property Exchange listserv to receive an email notification when a new item is posted to on the Exchange. PLEASE NOTE: Delivery cannot be guaranteed if you are not subscribed with your official University e-mail address (e.g. most faculty and staff: j-wildcat@northwestern.edu). 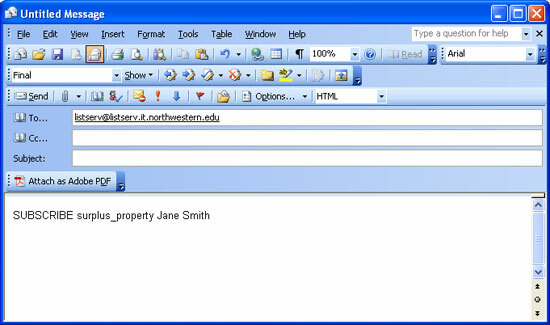 For more information on listservs at Northwestern, visit the NUIT Listserv Quick Reference site.